Vogue's New Book for Better Sewing (VoNBSS) gives us some interesting clues into home fashion sewing in the 1950s. Just the fact that VoNBSS existed is kind of baffling now--can you imagine if Vogue came out with a book of the same ilk today? I mean, it's virtually disposable, meant to be used in 1952, only with Vogue patterns from 1952. Can you even conceive of a Vogue's New Book for Better Sewing for 2009? A fully illustrated large hardcover (no doubt expensive to produce) featuring all new patterns that will become obsolete in a few seasons anyway? In contrast, VoNBSS tells its readers, "Each of the patterns recommended is available at stores all across the country, and the recommended fabrics are just as easy to find." The book assumes that you will have no problem locating fabrics like silk satin and shantung, wool jersey, organdy, and velveteen. The chapter called "Selecting Your Patterns" paints a picture in which new patterns are published every two weeks and are readily available at every department store in the "pattern department." Vogue also published a free "fashion folder" with the newest styles and suggestions for updating your wardrobe. I wonder how we'll see home sewing evolve in the next few decades. Will we see more independent stores and pattern companies pop up? Will online shopping become the only option unless you live near a major garment district? What do you all think? Essentially, it seems like we can look at VoNBSS not just as a great inspiration for sewing vintage, but also as an artifact of home sewing in its time. Look for more sewing history to come as I continue my sewing journey through VoNBSS! Well, I hope fashion sewing won't disappear. It used to be economical to sew your own clothes...and it still is if you have high end tastes. But when you can get cheap imported crap at giant discount stores, who would waste their time on "average" garments. I do think that online fabric sources will eventually become the source for better fabrics for those of us in non-metro areas. I've had very good luck with them, but I don't know how a newer sewer would know what to buy. I think there has been an increased interest in sewing and fashion thanks to Project Runway, and that's a good thing. I can't wait until it's on again. I live in a very rural location so I find it hard to get any kind of fabric! I tend to shy away from buying online as Meredithp said as a newer sewer I don't know exactly what I'm looking for. I normaly go by touch and cost. There was a fab little fabric shop in our town which shut, simply because the people retired. I think a small shop with good stock is a good alternative to a large shop. Also I have found the old books are by far the best! 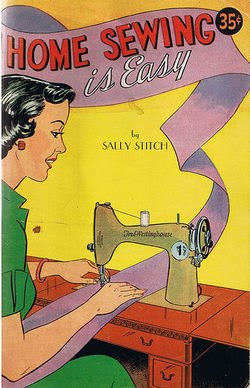 I find it amazing how many women used to sew a couple generations ago, and how much of that skill has been lost. A side effect is that I don't think women know as much about clothing anymore. If you look at old magazine ads, they describe clothes in very specific terms of fabric and cut. I don't think as many women today know what a bias cut is, or what gabardine means, let alone the retailers who sell the clothes! I live in London (UK) and even I find it difficult to find good quality fashionable fabrics suitable for apparel sewing. Yes, there is lots of cheap and not bad quality fabrics available in a couple of notable areas, but even there I don't see anything like the types of fabric and prints you see in high-end high-street fashion (not that I want to replicate the high-street, but I do like a lot of the fabric prints they're using at the moment). The one large department store in central London which has a fabric department has really cut back in recent years and I'm finding less and less inspiration there. As I said, I don't want to look like the high-street, but, taking inspiration from there, I really struggle to find fabric to translate my fantasies into reality. It seems that apparel sewing could learn a lot from the resurgence in quilting where there are a lot of new designers show-casing really interesting cotton prints. A nice thing about the internet, though, is that if you are isolated geographically (or even if you arent')you can see what's happening on the cutting edge (sorry for the pun). And my experience so far tells me that the cutting edge is being done by individuals, NOT corporations. Be vigilant and persistent because there are great resources out there - and you can find them on the Web! Lots of excellent points. Sarai, that is so true that consumers and retailers alike don't know much about clothing and how it's made. And contemporary knowledge of fabrics is scant. And there are few places to learn it if you can't feel and examine the bolts at a high quality fabric store. And yes, the internet is a great place to find the real trailblazers. Having chain fabric stores really isn't something to aspire to anyway. I love looking on Gorgeous Fabrics, and I trust the quality there. The descriptions are great, and the owner even suggests patterns to use so you get a better sense of what the fabric will work for even if you can't touch it. Anyway, I suppose I can never leave New York since I'm just too spoiled here!